This letter was found in a collection of documents once stored in the attic of Buckingham Friends Meeting. The entire collection has been deposited in the archive of the Friends Historical Library at Swarthmore College. The events recounted in this letter take place during the British occupation of Boston during the Revolution. Quakers Meetings throughout the colonies raised money to provide humanitarian aid to the civilians suffering during the conflict. Some of details of their tribulations are particularly gripping, including a pregnant woman with five children in Salem, Massachusetts who has to walk two miles to haul wood to heat her house and doesn’t even have bread to feed her family, and children in Marblehead who crawl into the ashes of extinguished fires seeking warmth. 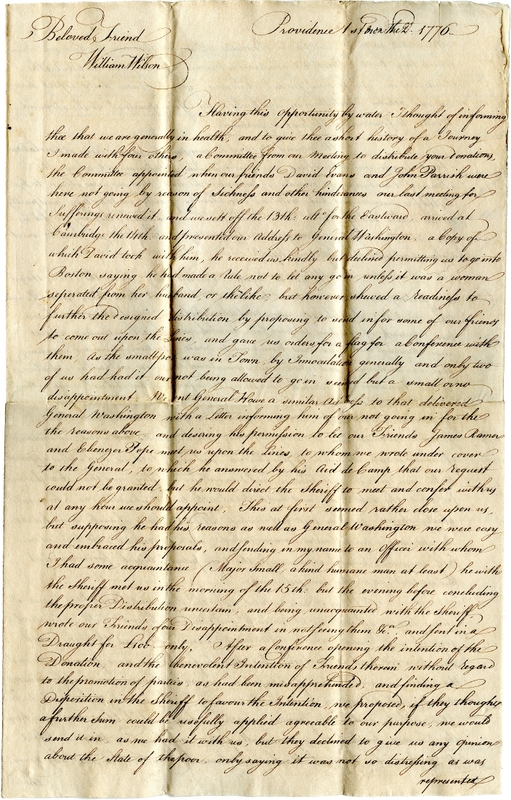 The letter was found with documents from both Buckingham Meeting and Middletown Meeting, but based on the range of dates for the Middletown and Buckingham documents, this 1776 letter was probably addressed to Buckingham Meeting. The author is Moses Brown, co-founder of Brown University. At the time of the letter, General Howe was Commander-in-Chief of the British Army. The outbreak of smallpox “by Inoculation generally” refers to the practice of inoculating patients with a weak strain of the disease in order to provide lifelong immunity. The inoculated patients, however, could still spread the disease to other people during the infections stage of the disease. Having this opportunity by water I thought of informing thee that we are generally in health, and to give thee a short history of a Journey I made with four others, a Committee from our Meeting to distribute your donations, the Committee appointed when our friends David Evans and John Parrish were here not going by reason of Sickness and other hinderances [sic] our last meeting for Sufferings renewed it, and we sett [sic] off the 13th ulte for the Eastward, arrived at Cambridge the 14th and presented our Address to General Washington, a Copy of which David took with him, he received us kindly but declined permitting us to go into Boston saying he had made a Rule not to let any go in unless it was a woman seperated [sic] from her husband or the like, but however shewed a readiness to further the designed distribution by preposing to send in for some of our friends to come out upon the Lines, and gave us orders for a flag for a Conference with them. As the smallpox was in Town, by Innoculation generally and only two of us had had it our not being allowed to go in seemed but a small or no disappointment. We sent General Howe a similar Address to that delivered General Washington with a Letter informing him of our not going in for the reasons above, and desiring his permission to let our Friends James Ramer and Ebenezer Pope meet us upon the Lines, to whom we wrote under cover to the General, to which he answered by his Aid de Camp that our request could not be granted, but he would direct the Sheriff to meet and confer with us at any hour we should appoint. This at first seemed rather close upon us, but supposing he had his reasons as well as General Washington we were easy and embraced his proposals, and sending in my name to an officer with whom I had some acquaintance (Major Small, a kind human man at least) he with the Sheriff met us in the morning of the 15th but the evening before concluding the proper Distribution uncertain, and being unacquainted with the Sheriff, wrote our Friends of our Disappointment in not seeing them &ca and sent in a Draught for £100 only. After a Conference opening the intention of the Donation and the benevolent Intention of Friends therein without regard to the promotion of parties, as had been misapprehended, and finding a Disposition in the Sheriff to favour the Intention, we proposed, if they thought a further Sum could be usefully applied agreeable to our purpose, we would send it in, as we had it with us, but they declined to give us any opinion about the State of the poor, only saying it was not so distressing as was represented without, we deferred the matter till we had Accounts out from our Friends which they kindly offered this assistance to procure after they had distributed the Sum sent in, and forward us out when done, which I now daily expect havg on our return wrote them in and Spoke to the Officer quartered at the advanced works to forward by the first Opportunity. All around the two Encampments is one Scene of Desolation Fruit Range and other Trees and some Buildings taken smooth away, the Town of Cambridge so crowded no lodging to be had, that we were oblidged to lye [sic] by the fire, uncovered but with our own Cloaths, partly on the floor, and partly on an under bed of Straw. This trial now to me, seemed necessary to fit us for our Journey by giving us a Sympathy with those we had to visit who had not the Comforts of Life. We got to Lynn on seventh day, being the 16th, stayed to the Meeting next day, and went to Salem. Friends at both places generally well 18th: visited Marblehead, assembled the Select men, and letting them know our Business of assisting the poor & ca, divided into three Companies, a select man attending each, we went from house to house of the poor seeing and enquiring their Circumstances, and where need required and they were within the intention of the Donation we relieved, avoiding those families that did not come within as well as the Guides could inform us. We found great poverty to abound numbers of widows and fatherless, wood and provisions greatly wanting among them, some poor women had to carry the former on their backs two miles, and instance of which was a woman with five Children, and as She told us, and indeed appeared to be near lying in with another had been out in a Cold day more than that distance for what she could bring, and had no bread in the house, she was one whom we gladly relieved, but thou wilt not conclude all were Objects of such commisseration [sic], she appeared a tender hearted woman indeed, she was contrited into tears at our visit, in which humble State we left the truly pitiable Object for whom I at this instant as at that time feel much. When I have reflected upon the divers [sic] necessitous States since, I have been so affected as to conclude had I not been favoured with an unusual fortitude and Guard upon the Affections the Services we went through would have been to hard to be borne, but through favour we were preserved through the while in a good Degree of Satisfaction, having sometimes a word of Consolation Counsil [sic] and Admonition occasionally arising. We visited this day and helped between sixty and seventy families, mostly widows and Children among whom the Donation hath hitherto principally fallen, not finishing there we left it to be done by Jeremiah Haeker and Samuel Collins. The next day being the 19th: divided into four Companies, a Select man with each, visited Salem, and in the afternoon feeling a draught further Eastward to Cape Ann, four of us viz. Benjamin Arnold, David Buffum, Thomas Sapham junr. and myself (leaving Thomas Steere to finish at Salem) sett [sic] off leaving on the way some relief, we got there the next day, bing the 20th: about 10 oClock, assembled the Select men and Overseers, and giving them an account of our Errand, we divided as before, one of them accompanying. The Town being scattering and for 8 miles from the extremes, we rode, the weather was very cold & windy however the Calls of the poor were so strong that we bore it with patience, here it took us part of three days with attention. The general distress of the poor here exceeded Marblehead, About half the most wealthy Inhabitants having removed back in the Country, leaving the poor unemployed they were very necessitous, having before been poor when the fishery was carried on, which being now wholly stopt [sic] we have nor with you can have very little Idea of their poverty, Yet the Children seemed healthy, crawling even into the ashes to keep themselves warm, The wood usually coming by water, and now almost wholly stopt [sic], they could keep but small fires for want of wood, Poverty and the want of Teams in the place obliged many to fetch it here as at Marblehead two miles by land, Bread Corn very scarce, 4/ for Indian, no Rye, the last upwards of 5/ the bushel from Salem Eastward, some families no other bread but potatoes for sometime, which with Chukerberry Tea was seen the only food was seen the only food for a woman with a sucking Child at her Breast, I hope not so many so, tho I may say it hath been a sort of School to us, for we never saw Poverty to compare with that of about 100 families in this Town whom we visited & relieved, besides so many poor not within the Limits of our Donation. By this time thou wilt conclude your Charities were in an acceptable time, many were indeed of that mind, and expressed, and some feeling by a Sense of Gratitude, The name of Quaker tho’ little known in these parts will be remembered, and perhaps some may no more think it a reproach. I have thought of John Woolman’s remark, in his Illness, of affluence relieving in times of Sickness, this was indeed the Case with some, for the Lame the aged and infirm were partakers of your Liberality. An aged woman of 96 or 97 her husband upwards of 80 with a maiden Daughter, the Support of her aged parents in times when business could be had, received with a sense of Gratitude which the silent Tear bespoke of the Contribution. Upon the whole I think you may be satisfied and united that so far is well, may a sense of favour be upon is that we have had it in our Power and been possessed with a heart to administer to the distressed I mean the Doners among you with ourselves here. On our return to Salem we found Thomas Gawthrop and Paul Osborn there, they have been returned and are about Swanzey, Robert Willy is yet about Dartmouth, A. Weal and D. Sand on their way to or on Nantucket. I was at point Shirley about 4 miles from Boston, where there hath been there Ship Loads of people landed from Boston, they were mostly dispersed, but found between 30 and 40 families who were relieved Another friend not having had the smallpox attended at another place in Chelsea where were about 50 persons who had been cleansed by smoaking [sic] most of whom he made Distribution to. These poor people were cruelly and inhumanly treated according to their account on Shipboard, being there about four Days, most of them, as they told me were robbed of part of their furniture Cloaths [sic] or money, but this I have no doubt will be highly disapproved of by General Howe. My Love to Friends with a Communication of any part of this scrawl that may be necessary and will be acceptable. You can download a PDF of the original letter here.